​While working out at the gym is the more ‘conventional’ method of exercising, not everyone can, or wants to make those daily trips. Gyms are expensive, can be crowded, and often intimating. With that in mind, we’ve written this guide on how to work out at home, saving you both time and money on a gym membership. This guide will feature 30 exercises, targeting different elements of fitness and areas of the body, all of which require no equipment whatsoever. If you're looking to work out beyond bodyweight exercises, we’ll also include a list of handy, budget friendly equipment you can utilise. Let’s analyse the benefits and drawbacks of working out at home. 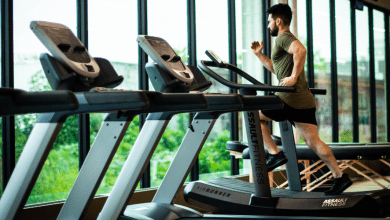 Save money – gym memberships can vary wildly in price, depending on a few different factors. That said, seeing that monthly direct debit come out isn’t the best feeling in the world, especially if you can’t go on a regular basis. Save time – this really depends on how close a gym is to your home. For me, that’s around 20-minutes. If I go 5 times a week, that’s over one and a half hours of traveling, or 86-hours over an entire year… not a brilliant way to spend time. 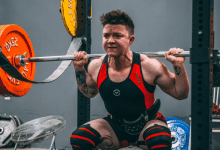 No pressure of anyone watching you – while you shouldn’t really be bothered what others are doing, it’s easy to be a bit paranoid that someone’s critiquing your form. When working out at home, you won’t have that issue. Don’t have to share equipment – one of the worst aspects of going to the gym is whether or not it’s going to be busy. When I walk in those doors and see the gym packed, a loud sigh will almost definitely leave my mouth. Waiting around for a piece of equipment to free up is both annoying and eats into your workout time. 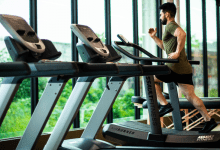 Lack of equipment – If you’re just starting your work out journey, chances are you won’t have a fully functioning home gym. These are expensive, and require a decent amount of room. As such, bodyweight exercises will make up the majority of the work out. No one to help – The chances are, you won’t have any personal trainers strolling around your house to ask questions. This can result in performing exercises with poor form, which can limit their benefits, and even risk injury in some cases. Limited space – Unlike a gym, which can often span a number of floors, you’ll be working with somewhat limited space. This can often mean moving furniture and belongings around to create a suitable workout area. I've found working out outside is a great way to combat this problem, which as you'll see shortly, is what we did. Before undertaking a new exercise plan, it can often be a good idea to define your goals. By knowing what you want to achieve, whether that be a flatter stomach, more defined arms or any manner of physical objective, it’s then possible to create an action plan accordingly. Once a set goal is created, specific exercises can be picked and combined into a workout that will allow you to achieve your target. Specific: Try not to set generic targets like; get into better shape, or loose weight. What is your idea of getting into shape? What does this look like? By having a specific, clear objective, you’ll know exactly what you’re looking to achieve. This could be; be able to run 10km in a certain time, be able to perform 100-push ups continuously or loose a specific amount in weight. Measurable: When setting a goal, it helps to be able to measure your success. If it’s in terms of aesthetics, you can take a picture at the start of your journey, and have a clear idea in your mind on what you want to change. You can then continue to take these photographs, allowing you to measure your progress. Achievable: Let’s be real here… We’ve all set those ludicrous new year resolutions that we’re never going to achieve. Fortunately, we’re not going to make those mistakes again. Making a goal achievable and realistic will allow you to stay motivated as you near closer to your target. Relevant: In terms of relevancy, make sure you plan of action is inline with what you’re aiming to achieve. If it’s bigger arms, make sure you’re targeting all areas of your arms with appropriate exercises. Time-bound: Lastly, we’ve got time bound. This is essentially setting a date or length of time in which you aim to achieve your goals. For example, if you want to create more defined pectorals, how long do you aim for this to take? This can tie in closely with achievable, as setting a more difficult target can often take longer to reach. While SMART objectives were creating in the world of marketing, their methodology can be used to help set achievable, helpful goals in all areas of life - just like this. Once you're goals are set, it's time to create a work out routine chock-full of exercises targeting the specific areas you want to improve. 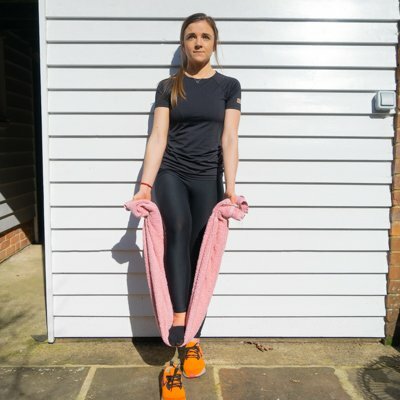 Unsure what exercises to do? No worries! We've got a list of 25 body weight exercises you can do at home coming up in just a sec. Let's check out this video from the highly reputable Jeff Cavalier from Athlean-X, discussing some top tips for working out at home. If you didn't watch the video, I'll quickly summarise some of the tips he went over below. As the chances are you won’t have any multi-gym equipment set up at home, utilising your surroundings is a brilliant idea. Think, using the side of your beds for dips, or counter tops for raised push ups. While these may not be specifically designed for exercises, they can offer a brilliant way to diversify your workout routine from home. For example, if a regular old push up is somewhat easy for you, try increasing the difficulty by changing up the exercise. This could be by adding a weighted backpack onto your back, or even by utilising a wall and performing one arm posted push ups. This way, you’ll get the most from your work out, without needing an form of equipment. Many people work out by performing a certain amount of repetitions, for a certain amount of sets. If you’re planning on doing a set of 12 reps, and you can feel you can keep going, keep going. The hardest reps will provide the most returns down the road. Ok, I think it’s about time we start looking at some of the best exercises we can do at home, without any equipment whatsoever. We’re going to break down these exercises into four categories; cardio-focused, upper body, lower body and abs. While these exercises will likely fall into multiple categories, they’ll be assigned by which element they are designed to focus on the most. We're going to start off out list with exercises that are primarily cardio based and great for burning calories. Star jumps/ jumping jacks are a great aerobic exercise, perfect for warming up your muscles before diving into some of the more intense options. How to perform: Start standing, with your legs closed together, with your arms down by your sides. Jump upwards, bringing your legs out to the sides and your arms up so that they are close to your ears, with your elbows slightly bent. Following this, jump back to the starting position, with your legs closed together and your arms by your side. This can be repeated for a certain amount of time, or a certain amount of reps, depending on your preference. Mountain climbers are a brilliant fully body work out with a great cardiovascular emphasis. How to perform: Start in an extended plank position, with your hands slightly wider that shoulder width apart, with your back as flat as possible. Try to avoid dropping your hips to the ground, or arching your back like a bridge. Bring one knee up towards your chest and then back to it's starting position, as if you're running along the floor. 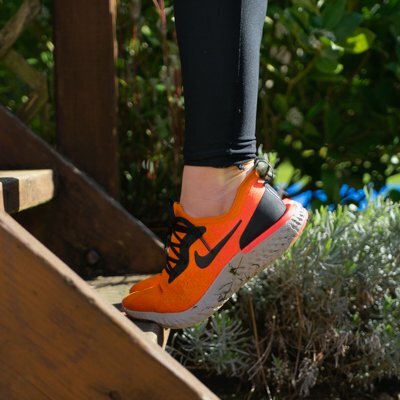 As your foot is returning to where it started, repeat the movement with your other leg. Continue these repeated movements for your desired time. A good starting point could be 3 sets of 1-minute, of course depending on your level of fitness. In order to increase intensity, perform the exercise at a faster pace, which is bound to get the heart racing. Squat thrusts are very similar to mountain climbers, in that they're a great total body work out with a strong cardiovascular focus. How to perform: Start in a push up position, with your hands slightly wider that shoulder width apart, with your back as flat as possible. Push off with both feet and drive your knees towards your chest. Once your feet are planted, push off the ground and bring them back to the starting position. To increase intensity, stand up in between each repetition. In terms of calories burnt per minute, burpees are known to be one of the most efficient cardio based exercises you can perform. 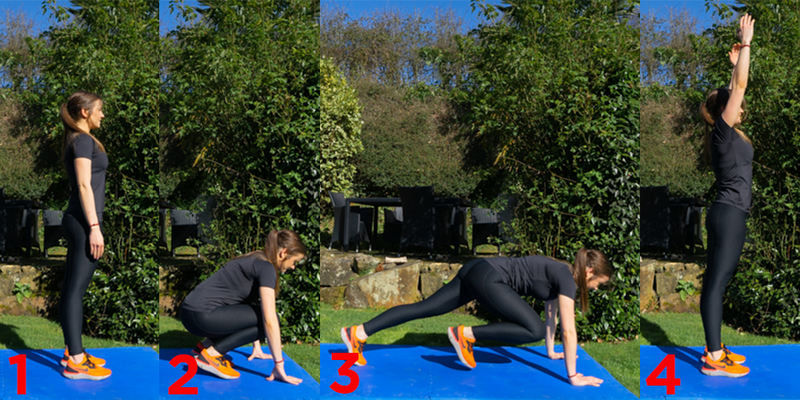 A burpee incorporates a squat thrust movement, similar to that we just discussed, alongside a push up and an explosive jump in between each repetition. If you're finding regular squat thrusts aren't quite doing the job, then burpees are almost definitely the way to go. There's also a number of different ways you can adapt the 'traditional' burpee in order to increase intensity. You can find out some more about this in this guide written by Box Life Magazine. Start in a standing squat position. Drop down into a push up position and perform half a squat thrust, so that your legs are extended. Finish your squat thrust, bringing your knees back towards your chest. Return to a squat position, explosively jump upwards, bringing your arms up above your head. Repeat those 5 steps for your desired amount of repetitions or time. As the name suggests, this involves blending two of the exercises we've previously mentioned. Both mountain climbers and burpees are a fantastic cardio work out that compliment each other nicely, so let's stick them together. Start this exercise by standing in a squat position, with your feet shoulder-width apart and with your hands by your sides. Drop down to the ground, putting your hands around a foot in front of your feet. Push up with your feet and extend your legs into a push up position. Perform 1 rep of mountain climbers (bring each knee towards you chest alternatively). Bring both feet towards your chest (finishing the squat thrust). Return to squat position, jumping up explosively once there. This is a fairly easy going exercises that's simple to do. As this is essentially running on the spot, minimum amounts of room is needed, which is particularly ideal if you're tight for space. How to perform: Stand with your feet roughly shoulder-width apart. Place your hands just above your waist, with your palms facing the floor. Bring your knee up so that it touches your right hand, and then return it to the ground. Repeat this action with your left knee. Try and mimic the motion of running, quickly alternating between legs. Check out this guide on performing high knees and it's different variations for some more information. Up next we've got some exercises that primarily focus on the upper body. As always, all of the following are more than suitable for home workouts, requiring no equipment. Push ups are one of the most well known, common exercises in the world. We all remember gym class in our younger days, struggling to string together a set of 10 push ups. Well... get ready to do them again, because they work. One thing worth mentioning here; it's incredibly important to maintain proper form. Don't worry though, we'll discuss this in a second. ​Place your hands on the floor, slightly wide that shoulder-width apart, with your hands aligned just above your chest. Fully extend your body with your feet on the ground, either together or slightly apart. Keeping your back straight, your waist should be around 1 foot off the floor. As you're performing your reps, aim to keep your back as straight as possible, not allowing your hips to sag or your back to arch. Bend your elbows, lowering your body closer to the ground. Aim to get your head as close to the floor as possible, without making contact. When doing this, it's important to not look down towards your feet. Keep your head straight, or look up slightly. Extend your arms, so that you return to your starting position. Again, keep your back straight, not allowing your hips to droop down. Top Tip: Finding this hard? No worries! You can always perform an assisted push up. This is where you place your knees on the floor, which will help to take the load off your upper body. Considering that our triceps make up roughly 3/4 of our upper arms, it's important to develop them in order to maintain proper body proportions. 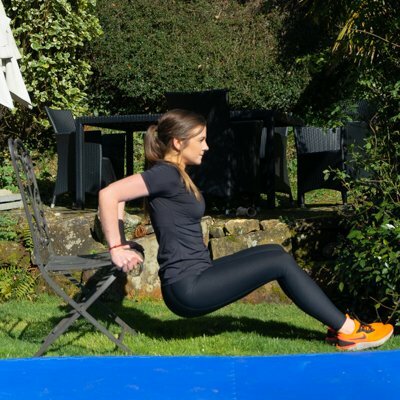 As such, dips are a brilliant way to isolate our triceps and tone them up. To perform a dip at home, a bit of creativity is going to be needed. A surface in which you can rest on is required, which could be the side of your bed, a chair or even a coffee table. As you can see in the images above, we've opted to use the side of a chair. Try and find something that is decently tall, so that you are able to go low enough to fully perform a dip and get the most out of the exercise. Place your hands palms down onto the side of which ever surface you're using, which in our case, is a chair. Extend your legs out and position your hips so that they're above the floor. Keeping your elbows close in, bend your arms so that your bottom gets close to the floor, without touching it. Once there, push back up, so that you reach the original position. This is a great variation of a regular push up that allows you to put more emphasis on your triceps, as opposed to your chest. Get into a regular push up position, with your back straight. Place your hands so that they are close together, forming a diamond/ triangle with your index fingers and thumb. They don't have to be touching, but you'll probably notice that it's a bit harder if they are. Keeping your elbows in as much as possible, lower yourself slowly so that your chest almost touches the floor. Make sure to not look down your body in order to maintain proper form. Push yourself back up to your starting position, again keeping your elbows in, not pointing out like a chicken dance (that was the only thing I could think of where your elbow point out). Biceps (front of the arms). This is a nifty little exercise that I first discovered from Runstastic. Doorway curls in particular are great for home work outs, as the chances are, you're going to have a door frame or two to use. 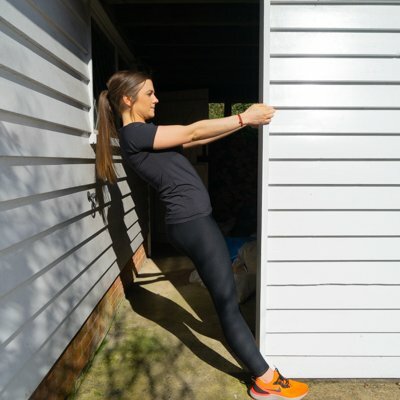 Stand in front of the door frame with your feet shoulder width apart, holding onto the frame on each side. Try and keep your hands in line with your chest. Slowly lean backwards, so that your arms are almost straight, with a slight bend in your elbows. Pull yourself back towards the door frame, so that your chest almost touches it. Top Tip: The wider you have your legs, the harder the exercise will be. Up next we've got another creative exercise you can do at home, this time with a towel. This is very similar to a traditional bicep curl you typically do with dumbbells, however this time using a towel and your own bodies resistance. Stand with your back to a wall, with the ends of the towel in each hand. Make sure to keep your back against the wall throughout the exercise. Place one foot inside of the towel, keeping your back and shoulders against the wall. Keeping your upper arms still and close to the wall, pull the towel upwards so that you arms are just short of 90-degrees bent. Slowly straighten your leg, bringing your foot back towards the floor. 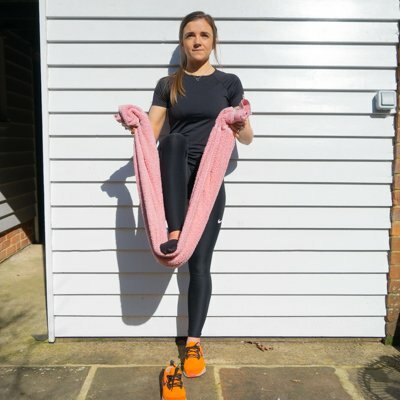 Of course, you can add more resistance by pushing your foot that's inside the towel downwards as you perform the exercise. Another way of doing this that I've heard a few people mention is with a backpack. You load up the backpack with your desired weight, and loop the towel through the bags straps. This is particularly ideal if you're used to lifting heavier weights, or finding it hard to use your leg. We've got yet another brilliant variation of the traditional push up, this time tailored to put emphasis on your shoulder muscles (deltoids). Get into a regular push up position, placing your hands on the floor slightly wider than shoulder width apart. Bend your elbows, so that you're body nears the floor. While doing this, lean forward slightly so that your hands are in line with the bottom of your chest. Unlike a traditional press up, push backwards, bending your knees so that you reach a squat-like position, with both hands still on the floor. Bring yourself forward, into your starting position. The next list of exercises are tailored towards working out your stomach area. Lets start of this section with a nice and simple exercise - the sit up. Depending on what type of flooring you have, getting a cheap exercise mat is probably a good idea, as the ground can be a bit harsh on your back. Failing that, a thick beach towel will do the job. Lay on the floor, with your knees bent and your feet planted on the ground. Place both hands behind your head, with your elbows pointing outwards. Bring your torso up towards your knees, bending at the waist. With control, bring your body back down to it's starting position. I find it often helps to put your feet underneath some kind of weight. This stops your legs from coming up mid-exercise, which can ruin your form. Using your arms to swing your body forward. This is why it's important to put your hand behind your head, so your arms swinging momentum doesn't help you sit up. Similarly, keep the grip of your head light, not forcing your head to look down towards your body. Aim to keep your head pointing straight in front of you. Lifting your feet up mid sit up should also be avoided, hence why it's recommended to weigh your feet down some how. Crunches are a nice step up from the traditional sit up, as they allow you to work your abs with much more isolation. With that in mind, you'll probably find them harder, however they tend to be more beneficial when looking to create tone and definition in the abdominal area. Place your hands either across your chest, or behind your head. Lift your upper body off the ground, so that your roughly half way to your knees, breathing out as you do so. Do not sit up fully, like you would when performing a sit up. With control, lower your upper body back to the ground, inhaling at the same time. Taking things up yet another notch, we've got the runners crunch. This is a more advanced version of the crunch we just discussed that works yore entire core, as opposed to isolating the abdominals. Lay on the floor, with your knees bent and your feet hovering above the ground. Place your hands behind your head, with your elbows pointing outwards. Bring your torso up towards your knees, bending at the waist. As you do so, bring your right knee to your chest, and move your left elbow so that it comes into contact with your knee. Bring your knee and body back down and repeat with the opposite leg and elbow (keeping your legs off the floor). Whilst performing running crunches, it's important to keep your legs above the floor at all time for maximum effect. Russian twists are a great exercise to throw into the mix if you're looking to develop your core as a whole, without solely isolating your abs. The vast majority of exercises we do typically involve some form of up and down motion, whether that be a curl, a sit up or a bench press. However, it's important to remember are bodies are capable of twisting and turning in more than one direction. With that in mind, exercises such as the Russian Twist, which operate within the transverse plane should always be incorporated into our routines for a more well rounded work out. Sit on the floor, with your knees bent and your feet planted on the ground. Here, it can help if your feet are underneath something that will hold them in place. If not, try your best to keep the still throughout the exercise. Keeping your back straight, lean backwards, so that your body is halfway between the floor and your knees. Grip your hands together, straighten your arms in front of your chest, tighten your core and raise your legs just above the ground. You can also keep your feet planted if you're finding this a bit tricky. Twisting your abdominal region, bring your arms down to one side, close to the floor. Hold here for a second. Straighten up your torso, resuming the starting position and repeat on the opposite side. Top tip: If you're finding this a bit easy, try holding a weighed object instead of closing your hands. This could be a pack of frozen peas (although they may defrost), a bottle of milk or literally anything that weighs your desired weight. So far, a lot of our abdominal exercises have focused on moving the upper body, so let's change things up. Leg raises in particular are great for targeting the lower region of our abdominal muscles, therefore complement crunches and sit ups nicely for a well rounded work out. What's more, leg raises allow us to develop the strength and flexibility of our hips and lower back, whilst at the same time, targeting our lower abs. All in all, this is a simple, yet effective exercise worth incorporating into your routine. Lay down on the floor, with your legs straight and your hands palm down by your sides. Raise your legs so that they are just above the floor, not allowing them to drop until your set is finished. Keeping your feet pointed downwards and your legs as straight as possible, lift them towards the ceiling (or sky). Ideally your legs will be at a 90-degree angle to your body. With control, slowly bring your legs back down to the starting position, hovering just above the floor. Thanks to it's simplicity and effectiveness, the plank is a go-to exercise for anyone looking to strengthen their core. What's more, there's a ton of variations that can be implemented to change the area of the body in which the plank targets. Firstly though, we'll stick to the basic plank, which makes use of isometric muscle contractions, by holding the pose/ position for an extended period of time. Get yourself into a push up position, however, instead of resting on your hands, rest on your forearms, with your elbow bent at a 90-degree angle. Look down at the floor, keep your back straight and your feet together. While side planks aren't particularly suited for developing ab definition, they are an important exercise needed to develop the quadratus lumborum, which is part of the posterior abdominal wall. Having a strong abdominal wall, and core in general, can help to prevent lower back pain, now and later in life. Also, unlike a traditional plank, side planks are ideal for targeting our obliques, which are two muscles located either side of the abdominals. With all this in mind, a side plank is a great exercise to throw in with the rest of your ab work out. Lay down on one side, with your elbow underneath your shoulder and face looking forward. While looking forward, raise your hips from the ground, trying to keep your body in a straight line. You can either place your other hand on your side, or up to the ceiling. Hold this position for your desired amount of time, then repeat on the other side. The next list of exercises are tailored towards working out the lower body. Squats have long since been a staple of lower body work outs. They're a brilliant body weight exercise that virtually anyone can do anywhere without equipment. 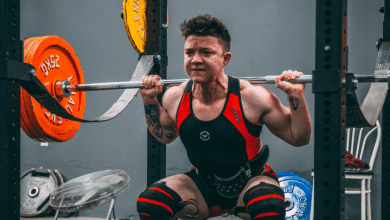 Squats are widely loved due to the fact that when performed at high intensity, they are known to produce testosterone and human growth hormone (HGH). This in turn helps to promote muscle growth body wide. In terms of versatility, not many exercises can match the squat. This is due to the fact that so many muscles are utilised when performing the exercise, from your legs all the way up to core. All in all, if you're not squatting, you're not doing it right. Only joking, but seriously, squats are amazing. Stand with your feet just wider than shoulder width apart. Without hunching forward, bend your knees and slowly lower yourself towards the ground. When your knees are bent at 90-degrees, stop and slowly return to the starting position. Top tip: If you're finding these a bit easy, or want to increase the intensity, try holding a heavy object in your hands whilst you squat. This is a great variation of the normal squat exercise that focuses on each leg individually. As such, each leg must work harder in order to perform the squat, allowing for a more targeted approach to developing your leg muscles. Stand with your feet just wider than shoulder width apart and your toes slightly pointing outwards. Place your arms facing out at shoulder level. Without hunching forward, bend your right knee and slowly lower yourself towards the ground, straightening the left leg to the side. Slowly straighten your right leg and return to your starting position. Ok, up next is another squat variation that involves isolating one leg at a time. By design, the Bulgarian Split Squat allows each leg to bend further and your body to get lower to the ground. 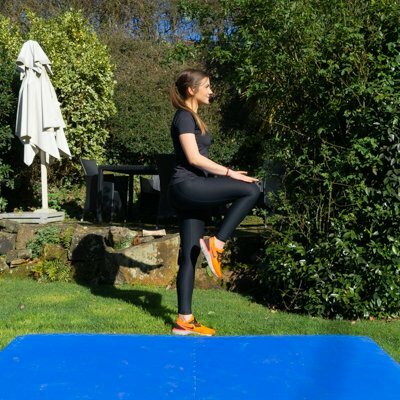 This allows for more emphasis to be put on the quadriceps and provides an all round tougher exercise than the two squats we've discussed earlier. Plus, your leg muscles and core will be more engaged in order to maintain balance throughout the exercise. The only downside to this exercise in particular is that you'll need some kind of equipment/ surface to rest your foot on. This is where a bit of creativity is required, as an object that comes up to approximately knee height is ideally needed. Fortunately, a chair, coffee table or even the side of a bed will do the trick. Stand in front of which ever object you're using, with it to your back. Make sure you're stood between 1-2 foot away. Put your right foot onto the bench, with the sole of your foot facing upwards. Put your hands behind your ears or down by your sides and bend your left knee down so that your body lowers towards the floor. Stop lowing yourself when your knee is bent at 90-degrees. Push back up with your right foot to your starting position. Repeat for 12-16 reps and change foot. Top tip: In order to increase the intensity of the exercise, hold a weighted object in each hand, and place them down by your sides. 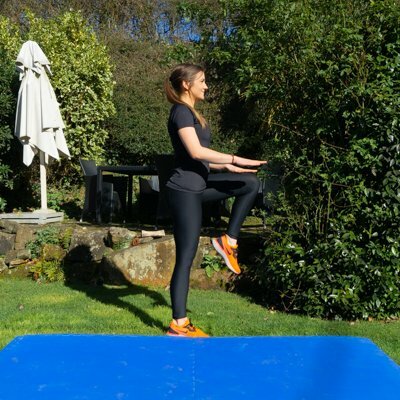 Moving onto our last squat variation, this time we've got the jump squat. As the name suggests, this involves doing an explosive jump in-between each reputation. By throwing a jump in-between each squat, you're able to further develop the power of your legs, much more so than a traditional squat. This jumping action also adds an element of cardio-training into what would normally do very little in terms of burning calories. 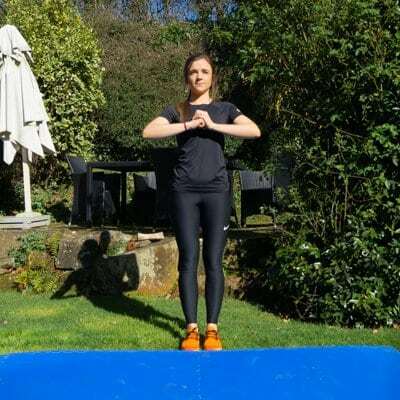 While standing, place your feet so that they're slightly wide than shoulder width apart. Slowly bend each knee, lowering your body towards the ground - as you would do in a traditional squat. 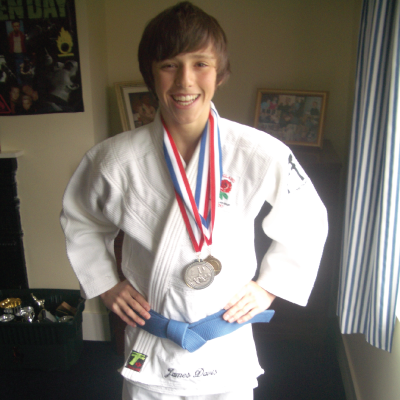 Push your self upwards as hard as you can. It's important here to really plant your feet and explode up as hard as possible in order to fully work the legs. Whist in the air, have your hand up above your head. As you land, bend your knees and with control, lower your body again for the next repetition. While a lot of the lower body exercises we've listed do hit the calfs, none have them have targeted them as the primary muscle. With that in mind, I think it's about time we introduce the calf press. All that's needed is some form of step that's roughly 4-5 inches tall and a desire to get them calfs burning. 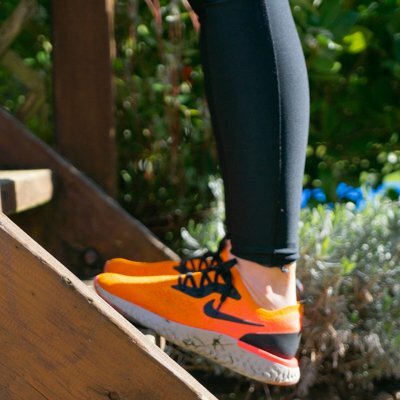 Stand on the edge, keeping the balls of your feet on the step, adjust your positioning so that half of your feet are over the edge. Lower the back of your foot closer to the ground (approx 2inches). Bring the heel of your foot back up, as high as you can. You should essentially be standing on tip-toes, but with the ball of your foot. Lower yourself back down to your starting position and repeat again. Top tip: Point your feet slightly inwards to fully isolate the outside of your calf. Lunges are a brilliant compound exercise that are perfect for home work outs. Compound exercises are exercises that utilise multi-joint movements to target more than one muscle or muscle group. 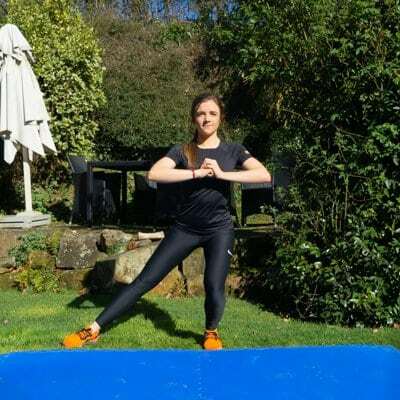 As such, lunges provide a great all round exercise, perfect for developing an array of different muscle groups in the legs, all in one movement. Stand up straight, with your feet shoulder width apart and your hands on your hips. Stand forward with one leg, lowering your waist as you do. Both knees should be bent at a 90-degree angle. Hold here for a second. Essentially, look as though you're about to propose to someone, but don't let your knee touch the ground. With control, bring your forward foot back to it's original position. Top tip: Hold a weighted object in each hand to increase intensity. While body weight exercises can definitely do the job, there's a good amount of affordable equipment out there that can really help you take things to the next level. Jump ropes are a fantastic way to change up your cardio routine and work your calfs in one fell swoop. What's more, they're insanely affordable. While a treadmill is a great piece of equipment for a home gym, they're huge and expensive. Jump ropes however, cost less than $20, take up no room and provide just as good a work out. Learn how to use a jump rope in the video below. Oh, what would we do without kettle bells? These things are amazing and incredibly versatile. Thanks to their dynamic exercises, they're not only great for burning calories, but for building strength and stability as well. While there is a bit of a learning curves with kettle bells, the below video should help you get to grips with how to use one, especially if you're a beginner. Unfortunately, abs are pretty hard to target without getting down on the floor, especially without equipment. As such, getting yourself an exercise mat is probably a good idea, as it'll make things a lot more comfortable. Plus, you can pick these up pretty cheap, so they're definitely budget friendly. Medicine balls are the perfect piece of equipment for increasing the intensity of your exercises. From Russian twists to squats, they're a welcome addition to most work out routines. They're particularly well suited for upping the difficulty when targeting your abs. For example, performing a regular sit up with a medicine ball above your head is noticeably more difficult than without. What's more, they come in an array of different weights and tend to be one of the cheapest pieces of fitness equipment you can pick up. Never used a medicine ball before? No worries, this video will show you how to fully make the most of working out your abs. Pull ups and chin ups are by far one of the best exercises you can do to develop the strength and endurance of your upper body. Pull up bars themselves are very easy to set up. All you need to do is hook the bar over a door frame, and you're good to go. Admittedly, it does take a bit of time to truly believe it's going to hold you up, but it does. Below is another great video by Jeff from Athlean-X showing you how to do 20 pull ups. Lastly, we've got resistance bands. These are the perfect substitute for dumbbells and can be used to perform an array of different exercises. For example, you can use them for curls, lateral raises, squats and an insane amount of other exercises. In fact, here's a list of 30 different exercises that resistance bands can be used with. They're cheap, easily stored and are even easier to use. Just because you can't/ don't want to head down to a gym, doesn't mean you can't work out effectively on a daily basis. Your bodyweight paired with the wonderful power of gravity can go a long way when working out. Plus, with the budget friendly equipment we previously listed, you'll be good to go, all from the comfort of your own home. Thanks for taking the time to read our article on how to work out from home, if you've got any questions or even some exercise suggestions, leave a comment down below.